STEREO VINYL LP! 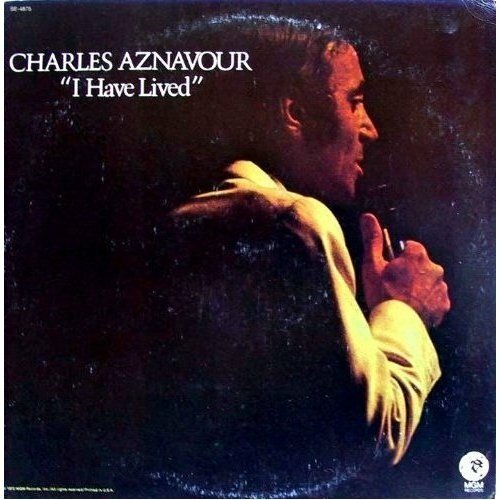 Charles Aznavour: I Have Lived! Arranged and Conducted by Christian Gaubert, Christian Chavalier, and Claude Denjean. 1972 MGM Release! Not Reissued On Compact Disc! TRACKS: A1. The Old Fashioned Way (Les Plaisirs Demodes); A2. No, I Could Never Forget (Non, Je N'ai Rien Oublie); A3. I Have Lived (J'ai Vecu); A4. The Happy Days (Les Jours Heureux); A5. To Die of Love (Mourir D'Aimer); B1. What Makes a Man (Comme Ils Disent); B2. Like Roses (Comme Des Roses); B3. The Ham (Le Cabotin); B4. We Had it All (Me Voila Seul); & B5. Little Fool I Love You (Idiote Je T'Aime).